Eagle Valley Middle School's Kayleen Schweitzer, right, was named Colorado's Middle School Guidance Counselor of the Year. The announcement came during a Friday afternoon pep rally. 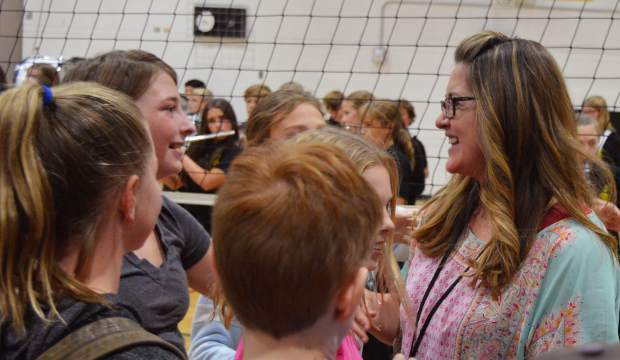 EAGLE — A local middle school guidance counselor was surprised during a pep rally with the announcement that she is one of Colorado’s school counselors of the year. Kayleen Schweitzer is a guidance counselor at Eagle Valley Middle School in Eagle and was chosen from among 1,600 school counselors around Colorado, Matthew McClain, with the Colorado School Counselor Association, said in making the announcement Friday, Sept. 7. Schweitzer was a “shining star” when the EVMS community was devastated last school year. 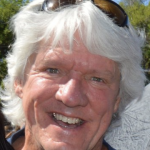 But that was just the latest in years of great work, said Nicholas Hoeger, an Eagle Valley High School guidance counselor and one of the many people who nominated Schweitzer. Schweitzer said she was “shocked and thrilled,” when the announcement was made. Schweitzer is one of three Colorado counselors of the year — out of elementary school, middle school and high school counselors. They’ll learn next month which of the three is Colorado’s Guidance Counselor of the Year. The winner advances to a national round of 50 finalists, McClain said. Winners are selected individuals based on several criteria, including: school counseling innovations, effective counseling programs, leadership and advocacy skills and contributions to student advancement.